I’d decided to fish with the wind at my back for a change which isn’t something I would normally do but with 45mph gusts I didn’t want to sit facing into the teeth of that, particularly with the wind chill factor, and besides I wanted to fish the deeper water that this end had to offer. On my last trip I fished in the shallow water into the wind and caught two tufties. I thought I was into a decent Bream with the first one until it popped up about 50 yards out. Nothing saps my confidence more than when birds start diving on my bait. As the water is relatively new to me in terms of Roach fishing i’d obviously been asking around trying to find some info out on the place. Speaking to people they all suggested fishing 40-60 yards out. Being cantankerous and stubborn I obviously ignored all that. Like anywhere I fish I wanted to do things my way and find my own path to success. So, obviously I banged two baits out between 90-100 yards ignoring everything i’d been told. I did put a third rod out at around 40 yards just to appease myself really. I was expecting bites straight away, then again I always do, but as is usually the case I sat behind three motionless rods all day, with the exception of a tuftie on one of the distance rods. Despite the birds diving down over my bait I was determined to stick it out with those rods because I just couldn’t believe that there were no Roach out there. Everything I have read tells me that big Roach like open water. As the afternoon wore on though I had to admit defeat and I brought one of those rods closer in to about 40 yards. So, now I had two rods close in and one at the very end of my casting ability with the tackle I was using. The bailiff came round doing his second rounds and he had a complete look of shock on his face when I told him i’d caught nothing. If you ever want a confidence boost I suggest you don’t talk to this guy. I sat there feeling a bit dejected that once again i’d had no bites. The light was starting to go and i’d seen no signs of fish activity on the surface when all of a sudden the left hand rod that had been fishing short burst into life. The fish had hooked itself and as I lifted the rod I felt the familiar head shakes of a Roach and judging by the way it was scrapping it felt like a goodun too. I caught a glimpse and my first impression was that it was a big big fish, then on my second glimpse something didn’t look quite right. 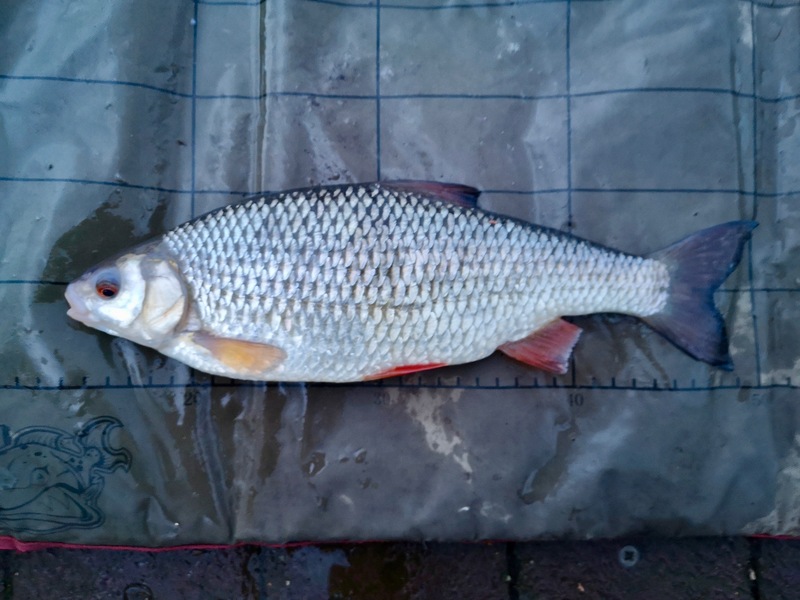 The colours on it were a bit dull and not silvery like a Roach and when I got it in the net my suspicions were confirmed as it turned out to be a Roach x Bream Hybrid. I didn’t bother weighing it but it looked around two pounds. Pleased that i’d caught but disappointed that it wasn’t a Roach I recast and straight away the bobbin dropped back again. This time it was a Roach but a small one around half a pound. A few more little un’s all around the same size before eventually I connected with one that was a better size. As it looked over a pound I weighed it and it came in at 1.4. I was chuffed with that and I was hoping that the bigger Roach had moved in. Unfortunately though the next fish was another hybrid albeit bigger than the first and then the Bream moved in. That quickly put a stop to the Roach action. Still, for an hour and a half I had a bite every cast but they all came to the one rod. Quite why the other two rods never had a bite was interesting. Maybe i’d built a bed of bait up around the left hand rod and that meant the fish had something to home in on, i’m not sure. I continued to get the odd bite in the dark but they turned out to be Bream and it was nice getting bites even though they were less frequent. I stuck it out until 8pm when I decided to pack up. I was hungry, my flask of coffee had turned to some manky stewed horrible tasting stuff and decided it was time to head back home. It had been a really interesting session though and again all part of the learning curve. Fishing short like everyone had told me is obviously the way to go although I think I will still fish one rod at distance if the tuftie’s will let me. I’ve not quite lost that stubborn streak just yet. With the night’s drawing out a few after work sessions are definitely on the cards as it seems to coincide with feeding time. Their are definitely bigger Roach to be had that’s for sure and i’m confident a two pounder is on the cards. Whether that will be this season remains to be seen but the future definitely looks quite Roachy. Previous Article Ahoy there me Carpy’s! !